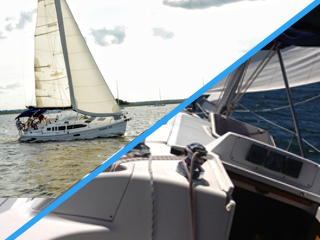 Learn to sail and become certified by the American Sailing Association! Courses are taught by USCG Captains who are also American Sailing Association Certified Instructors. Course Scheduling: Some courses are arranged on a demand basis (See Calendar Below); let us know if you’d like to take a class not currently scheduled. Maximum Class Size: Class size is normally limited to a maximum 8 people in the classroom / 4 people per boat. Minimum Class Size: We desire a minimum of 2 students per ASA class, however once one student signs for a scheduled class, the class is a go. For an additional $500 (above normal fee), we will give private instruction for one student, scheduled at your convenience. If any currently scheduled courses are inconvenient for you, contact us to inquire about private lessons. Private Lessons: For Custom Sailing Instruction (non-certification), we offer private lessons at $60 per hour (minimum 3 hours), scheduled at your convenience. Deposits are required for all classes! After a deposit is made we will ship out any required books. Deposits are refundable 30 days prior to class start date minus cost of books, shipping and handling fees. Deposits apply to the date mutually confirmed. Classroom instruction are held at 714 Beech Street in downtown Fernandina Beach while On-the-water instruction is conducted from the Fernandina Harbor Marina. Prerequisites: Candidates must attain the stated prerequisites before they may challenge or take the required ASA examination. Challenge a level: Any course can be challenged by expereinced sailors without taking the course. Cost $200 per course. We Offer Group Discounts Great for Friends and Families! This is a special beginner-level course for those who are interested in sailing and just want to learn a few basics. Completion of this course does not include ASA Certification. This class is scheduled on demand. Call, text, or email us. Includes ASA Fees & Certification, plus 1-year ASA membership. BKB-101 General Description: This course is designed to teach you to sail a boat of about 25-30 feet in length in light to moderate winds and sea conditions in familiar waters without supervision; a preparatory Standard with no auxiliary power or navigation skills required. ASA Exam Certification, plus 1-year ASA membership. BCC-103 General Description: Able to cruise safely in local and regional waters as both skipper and crewon an auxiliary powered sailboat of about 25 to 30 feet in length, in moderate winds and sea conditions. 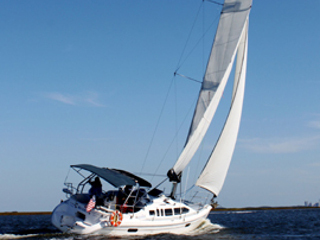 Learn to Cruise Safely in Coastal Waters as Both Skipper and Crew on an Auxiliary Powered Sailboat. Areas of instruction include: Safety, Rules of the Road, Weather, Seamanship, Gear & Equipment, plus Duties of the Skipper & Crew. All instructional materials, ASA Exam & Certification, plus 2 nights accommodation and 5 meals. BBC-104 General Description: An advanced cruising Standard for individuals with cruising experience. The individual can act as skipper or crew of a 30 – 50 foot boat sailing by day in coastal waters. The Standard includes knowledge of boat systems and maintenance procedures. Some of the areas covered in this class are: Planning the Cruise, Living Afloat, Weather, Seamanship, Navigation, Knowledge of Boat Systems, and Maintenance. BCC-103 General Description: Able to cruise safely in local and regional waters as both skipper and crew on an auxiliary powered sailboat of about 25 to 30 feet in length, in moderate winds and sea conditions. BBC-104 General Description: An advanced cruising Standard for individuals with cruising experience. The individual can act as skipper or crew of a 30 – 50-foot boat sailing by day in coastal waters. The Standard includes knowledge of boat systems and maintenance procedures. All instructional materials, ASA Exam & Certification. CON-105 General Description: Able to demonstrate the navigational theory required to safely navigate a sailing vessel in coastal or inland waters. There is no Sailing Skills part to this Standard. 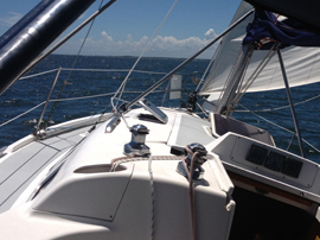 Practical application of this sailing knowledge is found in the Advanced Coastal Cruising Standard. This 2-day class is a valuable course open to all levels, with no prerequisite, and is strongly recommended. Coastal Navigation is the prerequisite for Advanced Coastal Cruising and Celestial Navigation. ACC-106 General Description: Able to safely act as skipper and crew of a sailing vessel about 30-to-50 feet in length. This is a day and nighttime Standard in coastal and inland water, in any weather. This class is a valuable course open to all levels, with no prerequisite, and is strongly recommended. We schedule these classes on a demand basis. CCC-114 General Description: Learn to skipper an auxiliary-powered sailing cruising catamaran of approximately 30-45′ feet in length upon inland or coastal waters in moderate to heavy winds (up to 30 knots) and sea conditions.This 2 day class teaches you the differences between monohull and catamaran handling, particularly docking and sailing fundamentals. We also offer this as a combo to our 104 class, as an additional day to the 104, completed on a catamaran. SMDEMC General Description: This 8 hour course is designed for the boat owner or charterer in order to provide practical knowledge of the marine diesel engine. We cover engine systems, theory and operation. An actual hands-on lab is included to demonstrate changing lube and fuel filters, bleeding the fuel system, water pumps, and battery-charging systems. As a recreational boat owner, you will learn how to conduct routine maintenance on your own diesel engine..
This1day course allows students to learn theory and practice repetitive docking and casting-off maneuvers to reinforce understanding of theory, methods, and skills. Both novice and experienced sailors will benefit from this course as the techniques apply on up to 50-foot inboard single-screw cruising yachts. 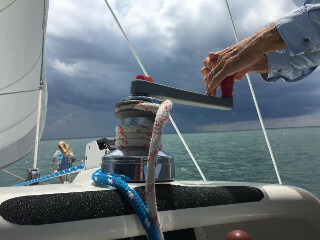 Upon successful completion of this course, students experience a significant increase in enjoyment in all of their sailing ventures because they will no longer fear docking at the end of the day. Spouses particularly enjoy mastering these skills because it helps them to become more proficient and confident as crewmembers.